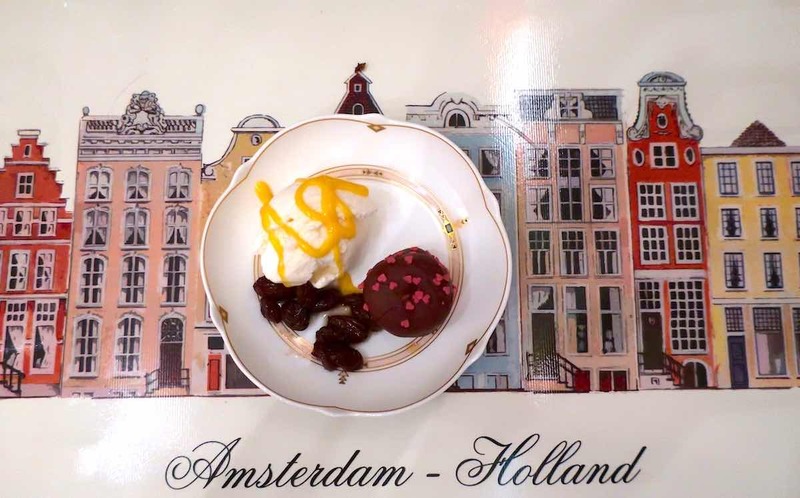 Want to discover a private dining experience with real dutch cuisine? 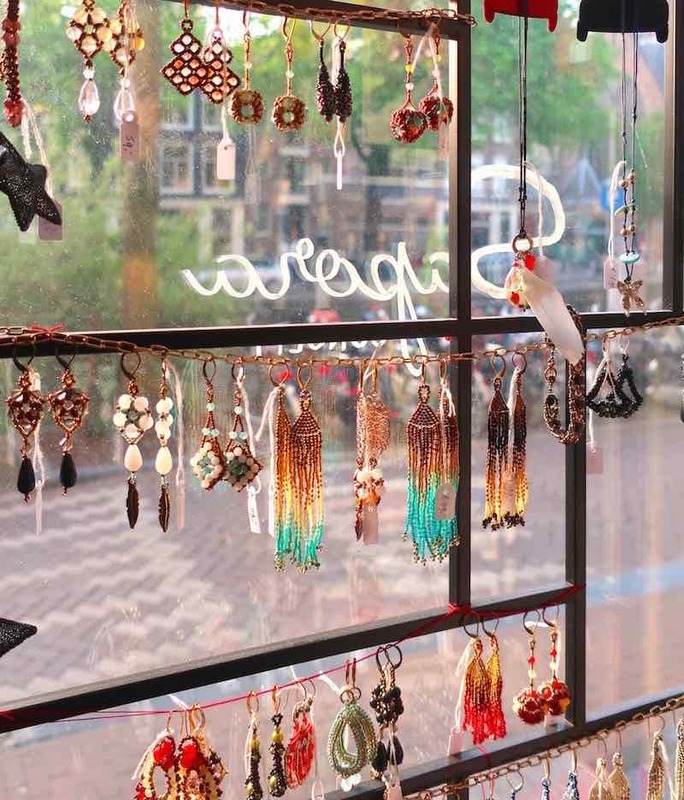 Visit Sapora, a concept store that consists of a private dutch restaurant with amazing art, delicious wines, beautiful jewelry and home decoration in the heart of the Amsterdam Red Light District. We were very lucky to have dinner at the dutch restaurant part of the store. When we entered the concept store, we didn’t really know where to look! Almost every spot is filled with the exceptional products (which are for sale). We were welcomed by Jacky Krielaart – the hospitable Dutch owner – and were invited at one of the perfectly set diner tables at the back of the store. 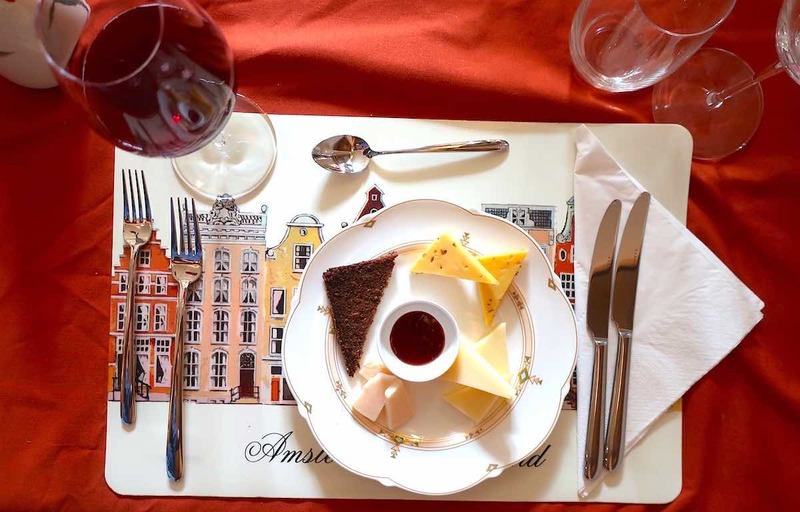 The first course of the dinner was a delicious cheese platter with a selection of heavenly Dutch cheeses accompanied with self-made Dutch “stewed pear” sirup. 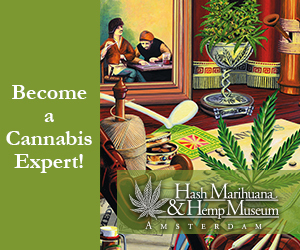 The selection consisted of the famous Old Amsterdam cheese, a goat cheese with cumin and Leerdammer. The cheeses bursted of a variety of salty and creamy flavours and were well balanced with the sweetnessof the sirup. 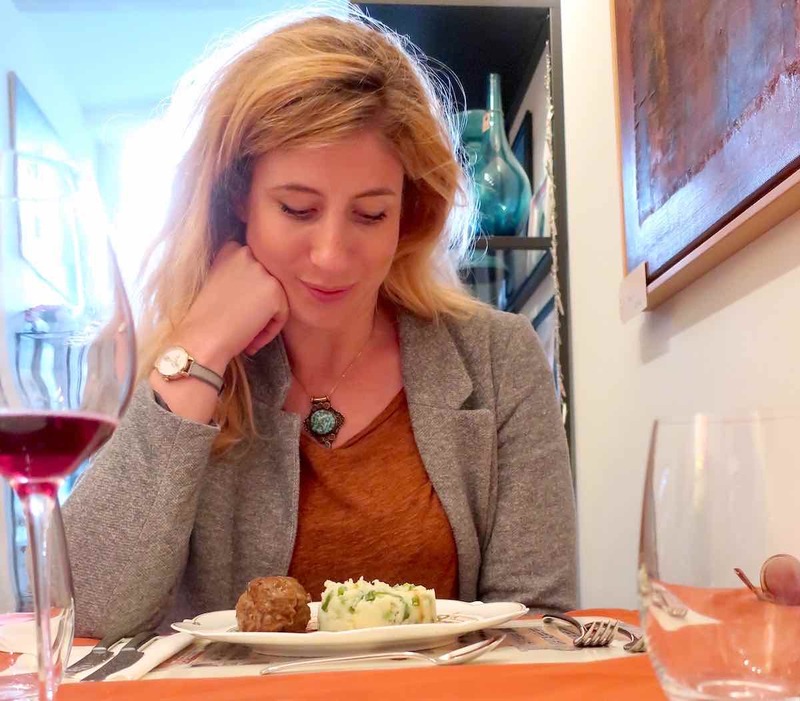 A great surprise was that Jacky is not only the owner and the chef, but also your company during the evening: She sits with you at the table (if you want to), so you can enjoy a personal conversation with a Dutch local about everything you want to know. While Jacky was preparing the next course, we strolled down the store to take a look at all the stuff she sells. Contrary to all the other shops in the Red Light District area – which mostly sell all the same low-quality touristic stuff- Jacky sells products which are literally unique because there’s only one of each of them. Some of them are even handmade by herself. For example, she makes the most beautiful jewellery with a oriental touch, which are great as a present to both a friend as to yourself. Furthermore, she sells a variety of vintage gifts like candlers, photoframes and sculptures and she makes her own paintings, which also create a nice atmosphere while having dinner. 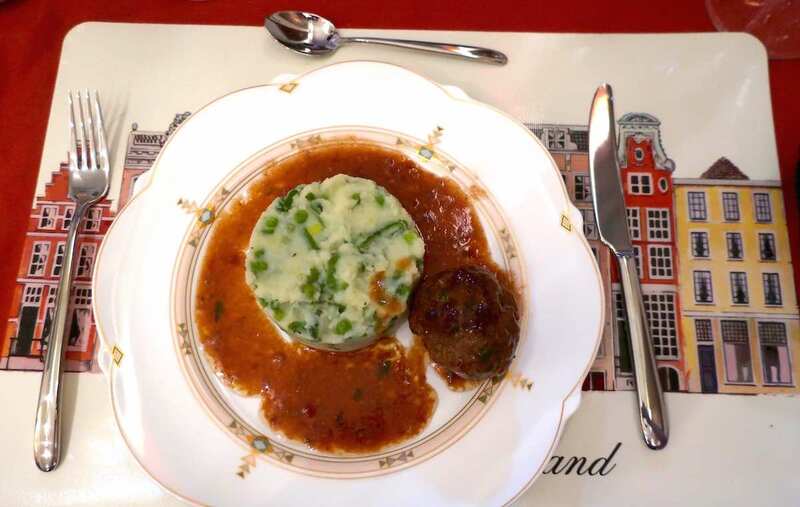 Our main course was a really fresh old-fashioned mashed patoto dish with andive and a dutch meatball, called “stamppot” in Dutch. It proved that dutch cuisine cán be very high standard. The courses were accompanied with personally imported and selected Italian wines from The Friuli Venezia Giulia regio. Ok, not really Dutch but that’s because Italians make much better wines than the Dutch. Of course, like everyting in the store, the wines are for sale as well. A funny fact is that this dutch restaurant used to be… a brothel! Even more interesting, is that it actually used to be the first work place of the famous twin sisters Martine and Louise Fokkens, locally known as “the old hookers”, who used to work as a prostitute for 50 years. After having a great dutch desert, we had amusing conversations with Jackie about living in the Red Light District area. It was very interesting to get to know the owner of this dutch restaurant so well, which made the evening really special. Sapora is a very good choice if you are in Amsterdam with a group of 4, 6, 8 or 10 people and when you want to have a personal dinner in a real Dutch restaurant. 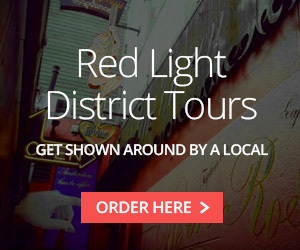 Moreover, you are ensured to get home with beautiful, unique souvenirs as well.